Depending on the type of survey your boat requires we will perform a number of various tests and inspections to ensure that your survey report is thorough and reliable. Listed below are the available services we can provide during your survey. Non-Destructive testing describes the process of surveying the boat without dismantling or otherwise harming the structure of the vessel or its components. Non-Destructive testing usually begins with a visual inspection and can incorporate methods such as moisture metering, and percussion sounding with hammer to investigate possible delaminations voids or saturated cores. 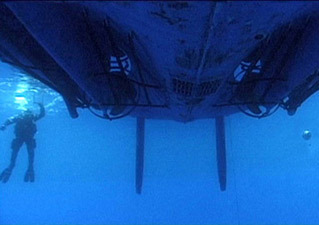 These methods will tell the surveyor if there is corrosion, rot or moisture in the interior parts of the hull, deck and appendages. Test and inspect engine & generator components, steering, controls, shafts, electronic systems, during the sea trial while all machinery and pumps are operating under the manufacturers specified loads. The safety equipment inspection includes taking inventory of required safety & man over board equipment, firefighting and distress equipment, navigational equipment, to ensure that all of this gear is in proper working order. All navigation lights and sound signals that the vessel has and is required by Coast Guard federal regulations, are checked out, with recommendations made. 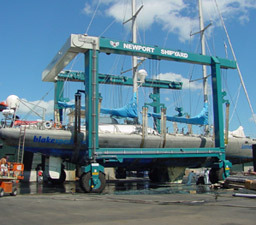 The mast and rigging components are inspected while under full sail, for wear, corrosion, fatigued terminal fittings and possible lightening strikes. The sails will be inspected for over-stressing, chafe and to ascertain the level wear and longevity of the sails. The engine is the most vital component of any boat; it can also be the most expensive item to replace. A properly performed engine inspection will ensure that the engine is properly installed and will identify wear and tear. A sea trial will be recommended so that the performance of the engine can be observed while the engine is operating under load. A thorough systems inspection of electrical systems wiring, and condition of batteries will tell if the wiring is safely installed through out the boat & adheres to the proper electrical specs. This inspection can go a long way to eliminating the chance for electrical problems or possible fire. All generators, fuel systems, air conditioning, navigation, water and sanitation systems are put through there paces. This type of inspection can "make or break" your sailing schedule - it can also prevent the need for an unnecessary haul out depending on findings. Refits can be as minor as rigging replacements and an Awl-Grip job or as extensive as a full on restoration to include new decking, complete interior redesign, re-wiring or machinery/engine replacements. In addition, they might involve modernizing the look of any yacht or helping to maintain the classic look of older boats. With over 20 years of experience managing multi-million dollar refits & new construction for both power and sailing vessels, when over seeing your refit we will deliver your boat on time and under budget.